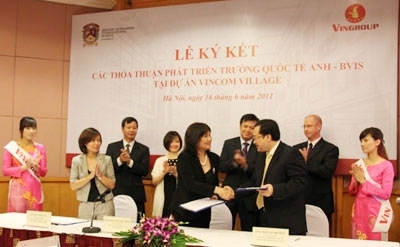 The British Vietnamese International School- BVIS has recently announced it would open international schools at the Thanh Xuan district’s Royal City and Long Bien district’s Vincom Village in Hanoi with the first enrolment slated in December 2012. BVIS is a member of the British International School which has been operating successfully in Ho Chi Minh City since 1997. The agreement to develop the two schools was signed with the Hoang Gia Real Estate Investment and Development Joint Stock Company and the Sai Dong Investment and Urban Development Joint Stock Company (under Vingroup), developers of the Royal City and Vincom Village, respectively. According to the agreement, BVIS will open schools that provide international quality education at both primary and secondary levels to the kids coming from Royal City and Vincom Village. BVIS is the largest international school in Vietnam operating within the framework of the national curriculum for England and Wales, complimented by the International Primary Curriculum to meet the needs of the 50 + nationalities attending the school. BIS is recognised by the Department for Education and Skills in the UK and is an accredited examination centre for Cambridge International Examinations and the International Baccalaureate Organisation. BIS provides a curriculum that is recognised globally as a pathway to the most prestigious universities around the world.